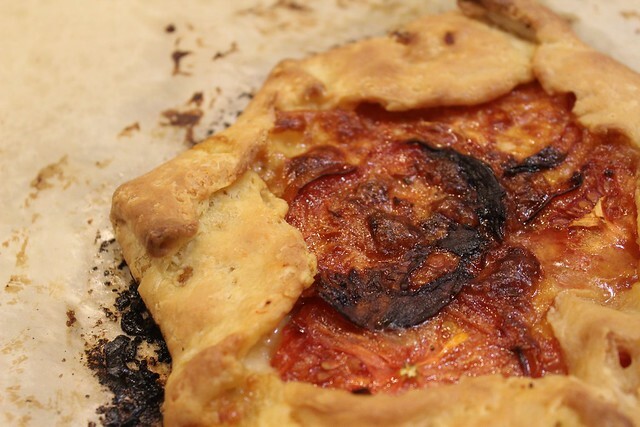 Welcome to the inagural post for the new Tuesdays With Dorie bake-a-long. We’re working from Dorie’s newest book: Baking Chez Moi. Its a beautiful book filled with simple homey French baking. Sounds complicated? Mais, non! According to Dorie, the French leave the fancy baking to the professionals and bake simple things at home. Things had to get a little creative when it came to rolling them out, though. 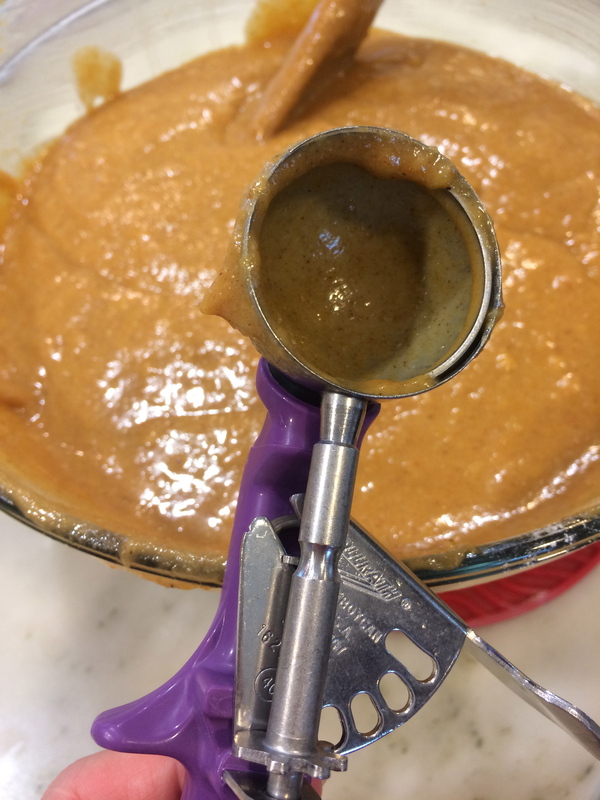 Dorie said to use a two teaspoon scoop. Hmmm, my smallest scoop is (I learned) four teaspoons. I scooped the batter onto my cookie sheet and then cut each ball of batter in half, and then rolled each half into a tiny little ball. They ended up about as big as my thumnail, before baking. Totally adorable. I got 19 cookies. They baked for about 9 minutes, cooled for a few and then got a dunk in a confectioners sugar frosting. Also very simple (sugar, milk and a drop of lemon juice). Dorie suggests sprinkling with sanding sugar for some extra sparkle. 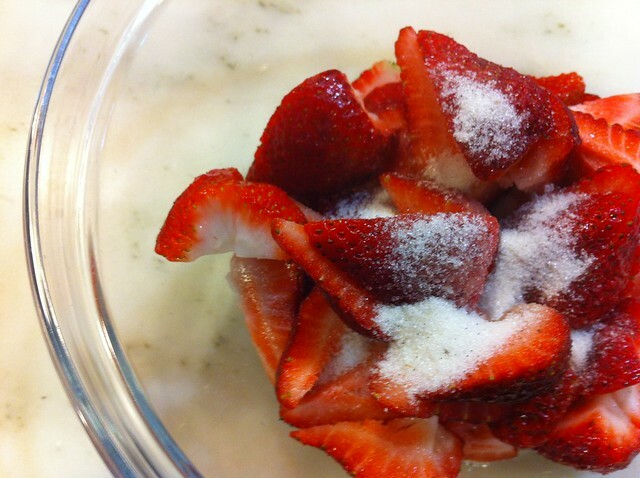 Instead of sugar, I ground up some sea salt and sprinkled that on top to cut the cloying sweentess of the confectioners sugar. Two out of my three kids enjoyed these cookies. The one who didn’t enjoy them REALLY loves chocolate, so that might be why he didn’t like them. They remind me of the ubitquious black-and-white cookie that you find in delis all over the northeast. All that’s missing is the dip into melted chocolate! If this is an indication of how this book is going to go along, I think I’m in for a tasty–and non intimidating–adventure. I do have pictures to go with this. but my computer seems to have eaten them. I will do my best to add them when I figure out what happened! ok, I know I’ve been away from this blog for a long time. My last post was December, 2013. Having three children in school really threw me for a loop. The driving. The homework. The crying. Its not that I stopped cooking–I just stopped taking pictures of it and telling you about it. I know that my absence has been noted. Even WordPress has changed things around. I’ll have to get used to the new editor and remember how to put pictures into this post. And so I bring you pumpkin bread. We love the stuff. My son, Adam, eats two pumpkin muffins for breakfast EVERY morning. Yes, every morning. And I am more than happy to supply him with that breakfast. I like this recipe because it calls for oil and not butter. 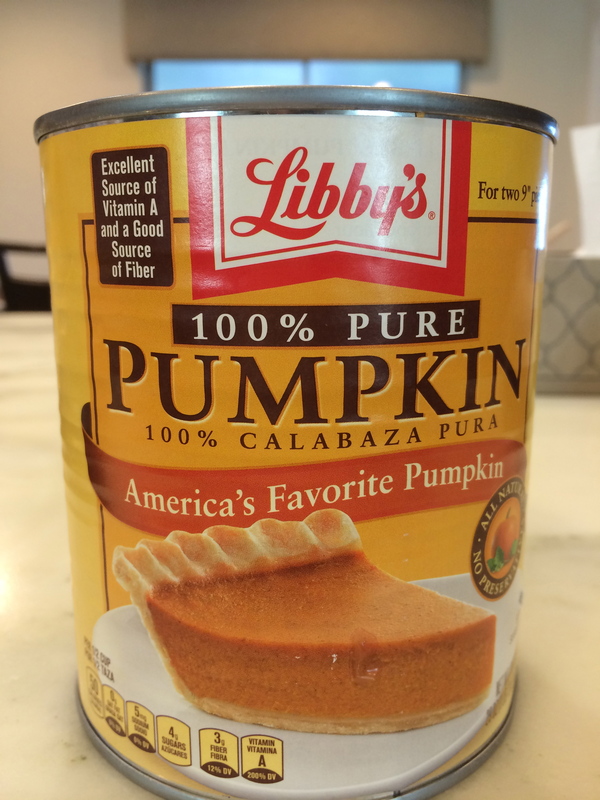 I like that because if I decide to make pumpkin bread RIGHT NOW, I can, and not have to wait for the butter to soften. 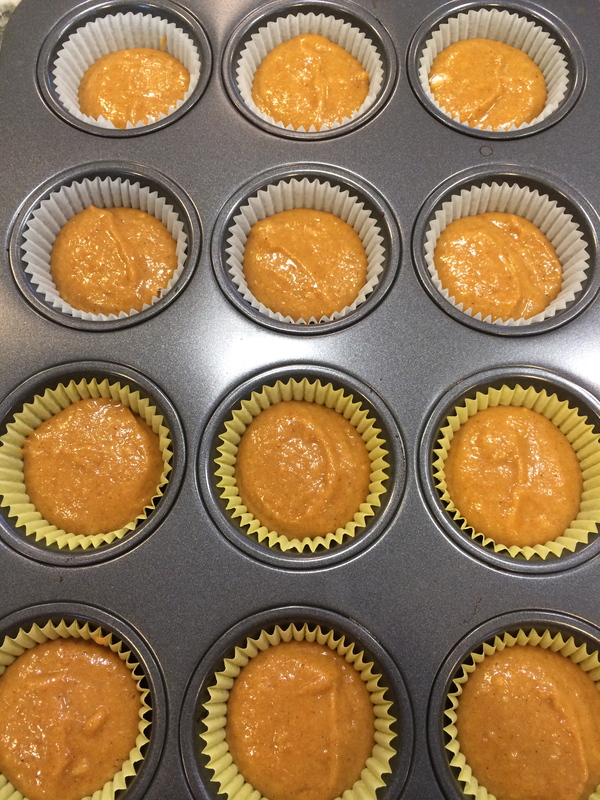 The muffins (or loaves) freeze beautifully, so don’t worry that you can’t use several dozen muffins before they go bad. Stick ’em in the freezer and defrost as you need them. I take a few out at night and in the morning they look like they just came out of the oven. 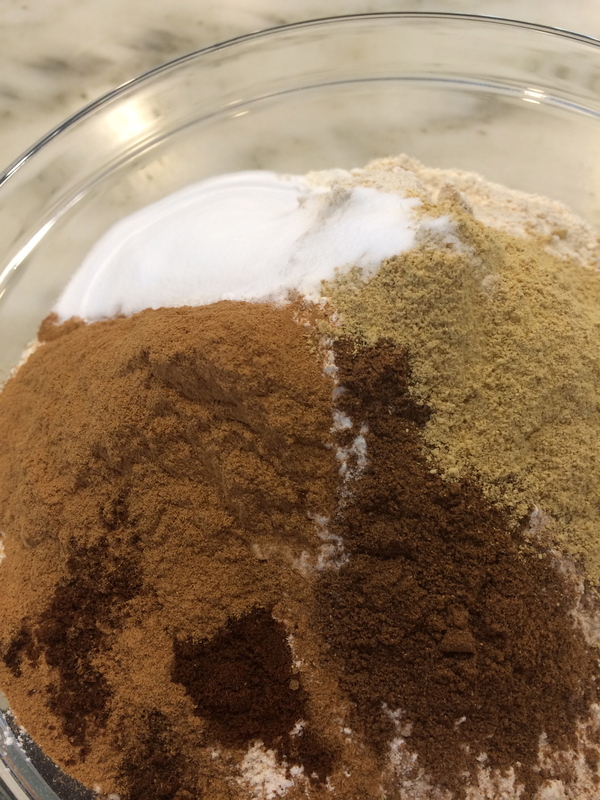 Add the dry ingredients into the wet in three additions, alternating with the milk. Bake at 350 for 20 minutes for muffins, or about 50 for loaves. I know its been a while. I’ve been baking. but not blogging or taking pictures. Life has been CRAZY. My boys started kindergarten in August. So, I’ve got three kids in three different classes, and that means 3 different teachers who want my time. Which is a lot. Plus, I’m training for another marathon, and planning another Ragnar Relay. so, I’m busy. But hopefully I’ll be back here more often. Gotta get back into the habit.. 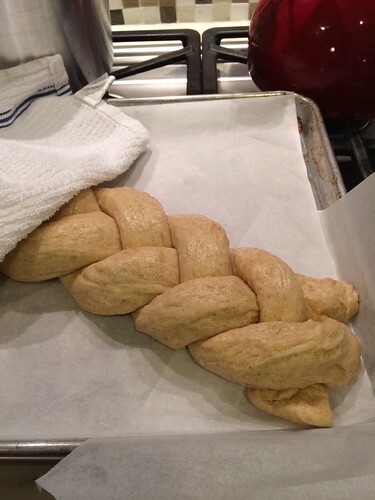 So, that brings us to this week’s assignment: Challah. 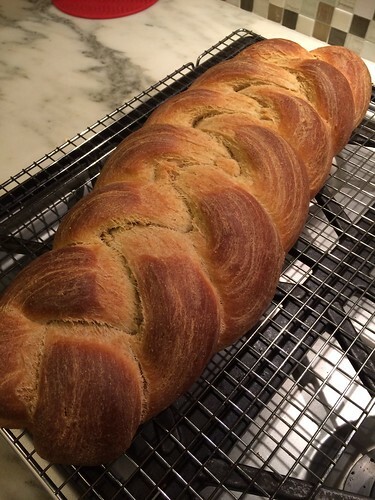 I’ve baked this one before, and I bake challah almost every week for french toast or for my synagogue. 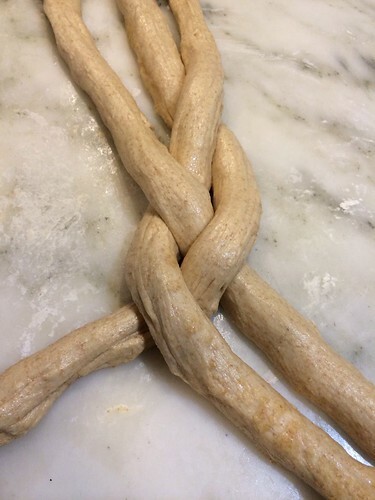 My standard recipe is from Marcy Goldman and uses fresh yeast. This recipe isn’t really all that different except that it uses milk and butter. Which makes this bread delicious. BUT it makes the bread dairy (duh). But people who keep kosher don’t mix meat and milk, and challah is traditionally served at shabbat dinner. In most homes Shabbat dinner is a meat meal–soup, roast chicken, etc. And so a bread with milk and butter in it just won’t fly. I mixed it up this morning when I realized that we were running low on french toast. 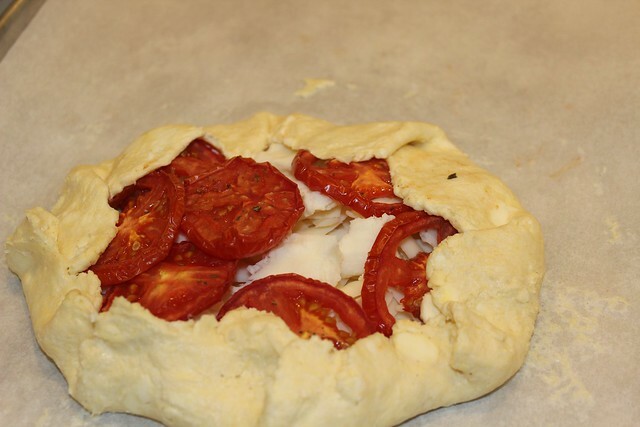 I managed to get it all kneaded together before we left for school and popped it in the fridge to rise. In the evening I braided it, let it rise and baked it off. of course, my house smelled delicious. I sliced into it today to taste it with some butter. It was delicious. Tomorrow it’ll turn into about 20 slices for French toast. Way, way back in the winter, I met my friend Miel for lunch. She’s a delightfully wacky displaced New Yorker. And she is always doing interesting things. And this time she gave me a jar filled with her home-made refrigerator pickles. 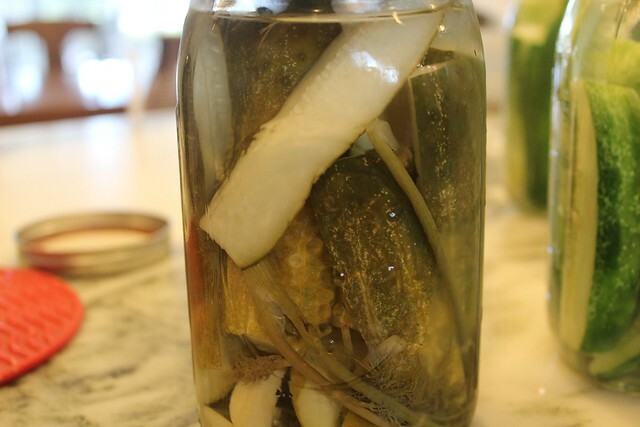 I’d never had home-made pickles before. These are pretty low salt and low sugar. They have plenty of garlic and dill flavor, especially if they sit longer than the minimum. They take about 5 minutes to make, and need at least 4 days in the refrigerator before they’re ready to eat. 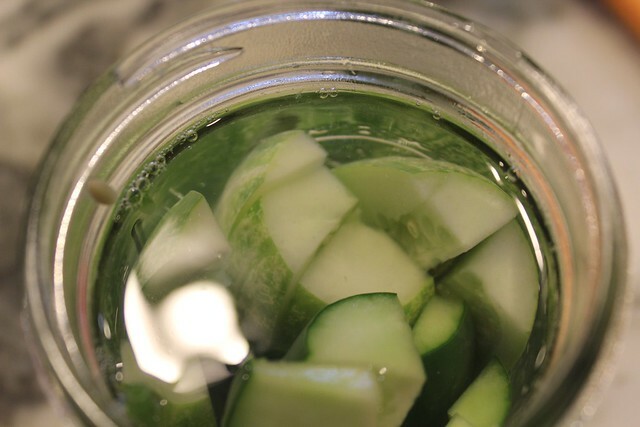 Once my kids had some, they were begging me to make my own so that they could have a constant supply of pickles in the fridge. older pickles in the front, new pickles in the back. You don’t even need official ‘canning’ jars for this. 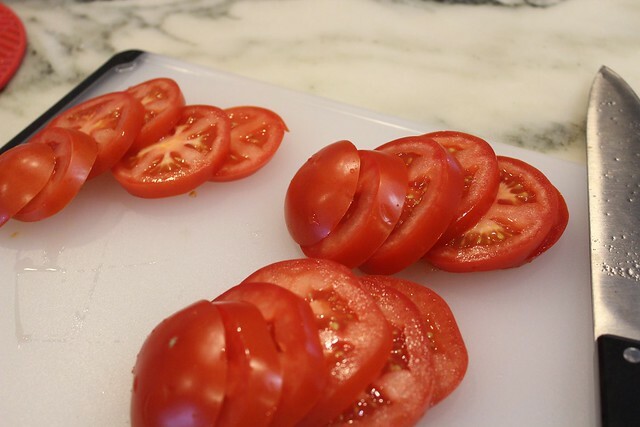 You could easily use jars from tomato sauce or even peanut butter. Don’t let a small jar collection stand in your way. I don’t see why you couldn’t do this in rubbermaid containers. the garlic flavor will intensify the longer the pickles sit. *I can’t say for sure what kind of sea salt I’m using. I took a baggie of it from my inlaws vacation kitchen. 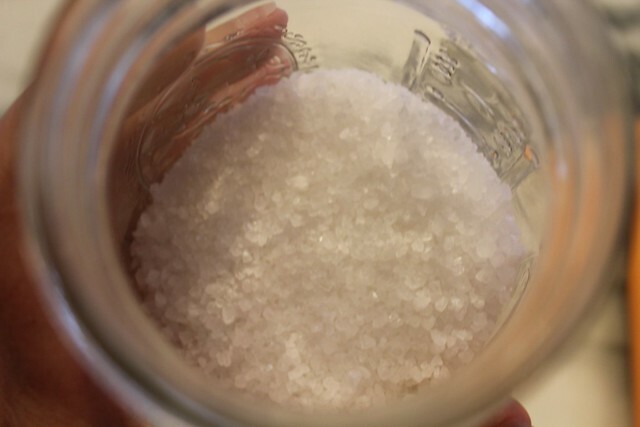 Who needs a 5 lb container of sea salt? Its a coarse rock variety. definitely not flaky. Save the flaky stuff for something else, don’t use it here! 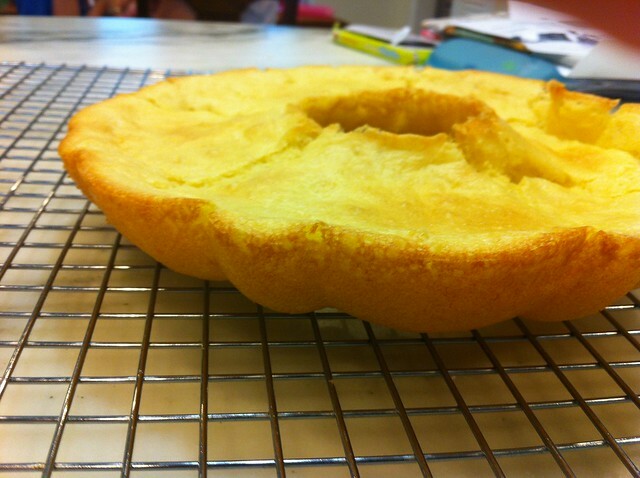 This week’s assignment was to make a Savarin. A cake I’d never heard of. Brillat-Savarin famously said: “Tell me what you eat, and I will tell you what you are.” He also has a cheese named after him. Outside of that I had very little information, or the proper cake pan to make this cake in. I almost rigged up a round pan with an empty can of tomatoes in the center. But, luckily, my parents were coming for a visit and my mom agreed to bring a bunt pan for me to borrow. 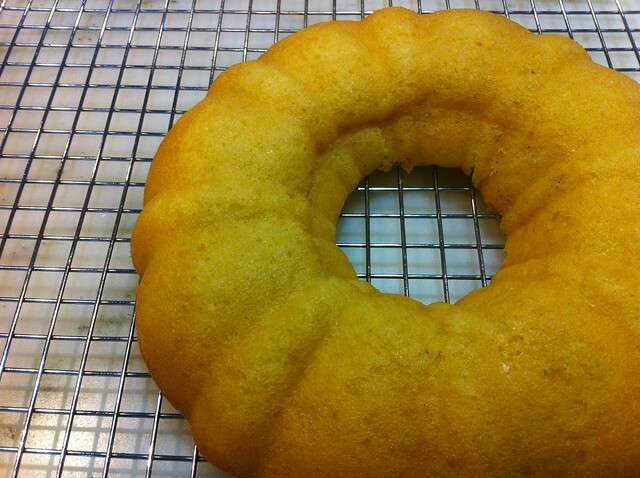 A traditional Savarin is baked in a smooth ring mold (like a shallow, metal, jello mold) mine would not be so traditional. But, it was fine, and I didn’t have to buy a piece of kitchen equipment that wasn’t going to be used again. The batter for this cake is a runny yeast batter. 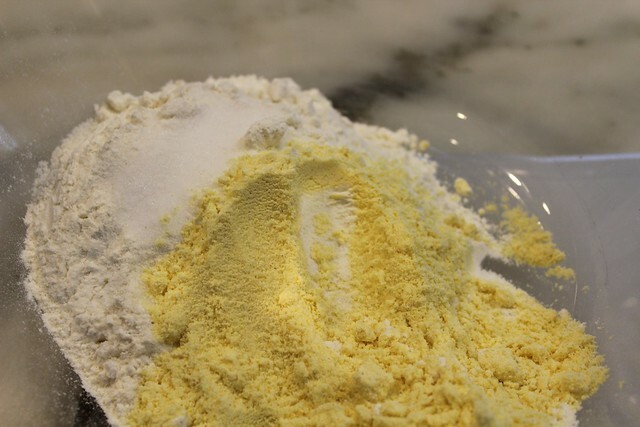 Just water, yeast, a drop of sugar, an egg, butter, and flour….and not a lot. Only 3/4 of a cup. I had serious doubts that it would fill the bottom of the pan. It did–barely. It rose once in the bowl, and then again in the bundt pan. I left the house to get Dorothy from school and my mom put it in the oven while I was out. It sank. It was very concave. Not a whole lot of cake there. But we pressed on. Luckily it came out of the pan without any problem, and when we were ready to eat it, I soaked it with a vanilla simple syrup and a tiny bit of dark rum. I skipped the whipped cream completely. David is lactose intolerant, and it was nice to have a practically fat free dessert. I filled the center with macerated strawberries, raspberries, and some chunked up mango. The dessert got gobbled up, it was plain, but tasty. The fruit may have stolen the show. 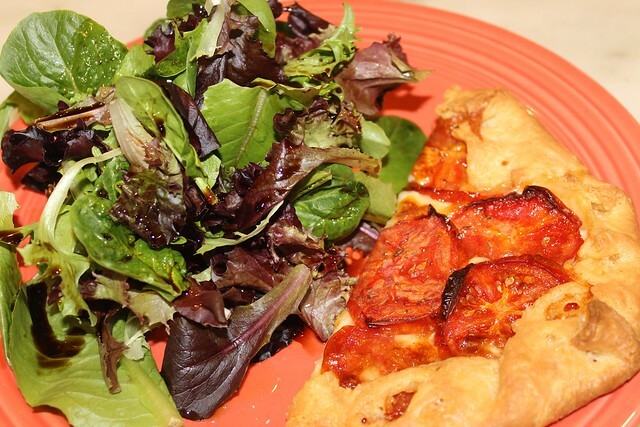 For more tasty examples, visit the Tuesdays with Dorie page! cover the bowl and let rise in a warm place for about 15 minutes. it will rise, but not double. Bake at 350 for about 20 minutes until golden brown. 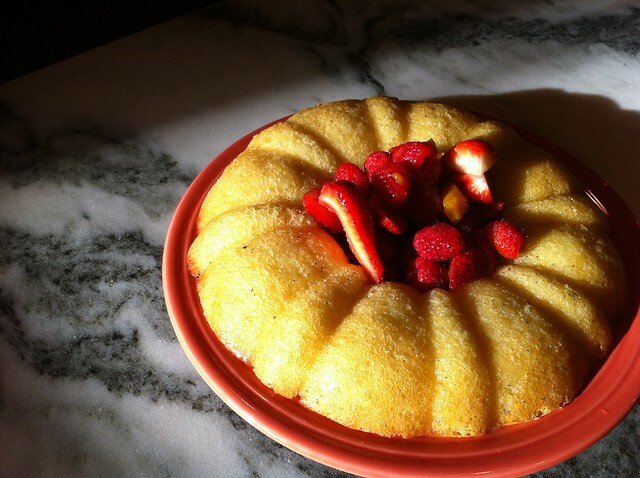 when you are ready to serve, soak the savarin completely with the syrup (you’ll have leftover syrup. save for iced coffee!) and sprinkle with a small amount of rum if desired. 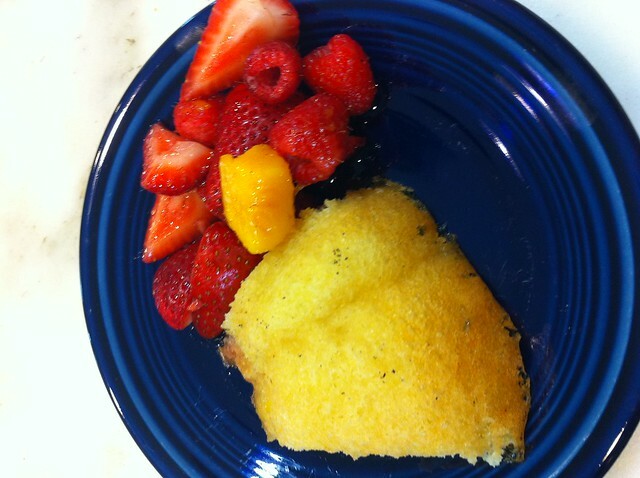 Serve with macerated fruit and whipped cream!